Colorful seasons The four seasons vary significantly in characteristics and can prompt changes in the world around them. But what causes them? Let's try to figure out. 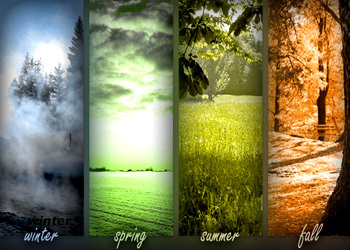 In a year Earth shows four seasons, namely Winter, Summer, Spring and Autumn or Fall. The ecologists mostly use a six season model for temperate climate regions that includes pre–spring and late–summer as distinct seasons along with the other traditional four seasons. The colors of the leaves of the deciduous trees (the plants that lose their leaves every year and grow them back) change as the seasons change with time in a year. Every season stays for a period of time. Example: Areas which are closer to equator have long summers. Every part of the world doesn't have four seasons. Most of the people think that the reason for different seasons is due to the variation of Earth&apos;s distance from the Sun as the Earth revolves its orbit. This is not true, because when it is summer in the Northern Hemisphere, it is winter in the Southern Hemisphere. Let us study the cause for the four seasons. Cause of four seasons The four seasons happen because of the tilt of the Earth's axis. At different times of the year, the sun's rays hit different parts of the globe more directly. The changing seasons are caused by the changing position of the Earth in relation to the Sun. The seasons keep changing because the tilt of the Earth&apos;s axis never changes while the Earth circles the Sun. 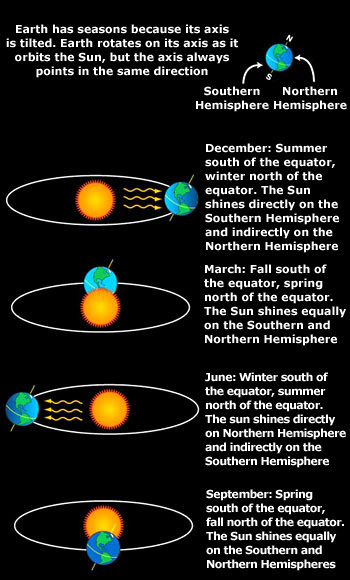 The inclination of the Earth&apos;s axis of rotation to the orbital plane coupled with the yearly revolution around the Sun produces the changing weather patterns called the seasons. One way to understand this is to picture which way the tilt of the axis causes the North Pole to slant at different times of the year. When the North Pole slants toward the Sun, the Northern Hemisphere receives the most sunlight and it is summer there. When the pole slants away from the Sun, the Northern Hemisphere receives the least sunlight and it is winter. Spring begins when the pole starts to slant toward the Sun, and autumn begins when the pole starts to slant away again. Reason for Earth&apos;s tilt The main consensus of scientists is that it has to do with Earth’s formation along with the rest of the planets in the Solar system. Have you ever wondered why the Earth is tilted instead of just perpendicular with its plane of orbit? 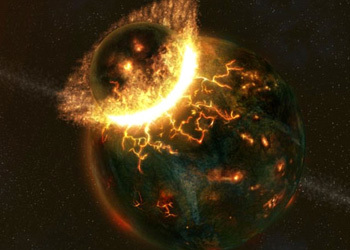 As the history goes, the theorists believe that Earth after its formation some billion years ago, something very big hit the young Earth to knock it off. So it is believed that instead of rotating with its axis perpendicular to its orbital plane, Earth was tilted 23.45 degrees from its perpendicular. Incidentally, the big asteroid that hit the Earth also knocked a chunk of it out which later became our Moon. This is a generally accepted theory. So, Earth orbits the Sun with its tilted rotation. That&apos;s how different parts of Earth get direct rays of Sun as we travel through the year. Actual reason behind four seasons It is the tilt of the Earth that causes the Sun to be higher in the sky during the summer months which increases the solar flux. Does this tilt of Earth matter to weather? Let us understand this by taking a piece of paper and a flashlight. Shine the light from the flashlight straight onto the paper; an illuminated circle will be seen on the paper. All the light from the flashlight is illuminated in that circle. Now, slowly tilt the paper. We observe that the circle elongates into an ellipse. All the light is still in that ellipse, but the ellipse is spread out over more paper. The density of light drops as the amount of light per square centimeter drops (the number of square centimeters increases, while the total amount of light stays the same). This is true in the case of Earth. When the sun is overhead, the light is falling straight on you, and so more light (and therefore more heat) hits each square centimeter of the ground. When the sun is lower in the sky, the light gets more spread out over the surface of the earth, and less heat (per square centimeter) can be absorbed. Since the Earth&apos;s axis is tilted, the sun is higher when you are on the part of the earth where the axis points more towards the sun, and lower on the part of the Earth where the axis points away from the sun. The actual reason for the seasons is the tilt of the Earth&apos;s axis, for without the tilt in the axis of the Earth (at 23.5 degrees), we would have no seasons and there would be no change in our climate. The amount of sunlight energy would remain constant, then each location on earth would have 12 hours of sunlight and there would be same temperature through out and same weather every month. Some areas would always be cold, and stay cold always. Some always humid, some mostly rainy for ever! Every area in the world would not experience four seasons. As the tropics are located in the center of the globe, they do not experience the effect of the Earth’s tilt, also they cannot experience the extreme seasonal changes that occur at Northern and Southern Hemispheres. The tropical rain belt (ITCZ - Intertropical Convergence Zone) is mainly responsible for different seasons in the tropics. It switches between the northern and southern tropics, resulting in a dry and a wet season. In general, the summer will be warmer than winter (in each hemisphere) due to the hot Sun's rays that hit the Earth at a more direct angle during summer than the rays that hit during winter. Also during summer the days are much longer than the nights. During the winter, the Sun's rays hit the Earth at an extreme angle, and hence the days are very short. Such effects arise only due to the tilt of the Earth's axis. Sunrise and sunset are not 12 hours apart The dates on which day and night are each 12 hours occur only for a few days before and after the equinoxes. The specific dates for this occurrence are different for different latitudes. Why day and night are not of equal duration? 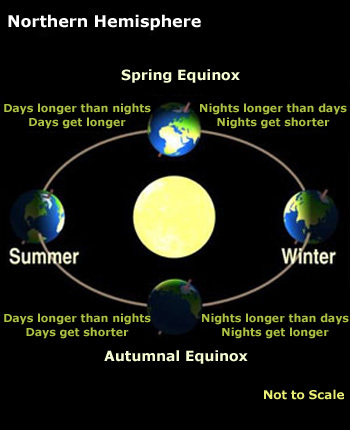 The day and night are not of equal length exactly at the time of the March and September equinoxes (also known as spring and autumnal equinoxes respectively). The dates on which day and night are each 12 hours occur only for a few days before and after the equinoxes. The specific dates for this occurrence are different for different latitudes. If we consider the day of the equinox, the geometric center of the Sun&apos;s disk crosses the equator, and this point is above the horizon for 12 hours everywhere on the Earth. However, the Sun is not simply a geometric point. Sunrise is defined as the instant when the leading edge of the Sun&apos;s disk becomes visible on the horizon, whereas sunset is the instant when the trailing edge of the disk disappears below the horizon. At these times, the center of the disk is already below the horizon. Furthermore, atmospheric refraction (or bending) of the Sun's rays cause the Sun&apos;s disk to appear higher in the sky than it would if the Earth had no atmosphere. Thus, in the morning, the upper edge of the disk is visible for several minutes before the geometric edge of the disk reaches the horizon. Similarly, in the evening, the upper edge of the disk disappears several minutes after the geometric disk has passed below the horizon. If we observe within a couple of degrees of the equator, the period from sunrise to sunset will always be several minutes longer than the night. At higher latitudes in the Northern Hemisphere, the date of equal day and night occurs before the March equinox. 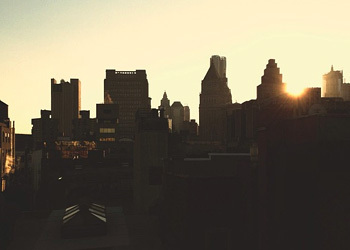 Daytime continues to be longer than night time until after the September equinox.